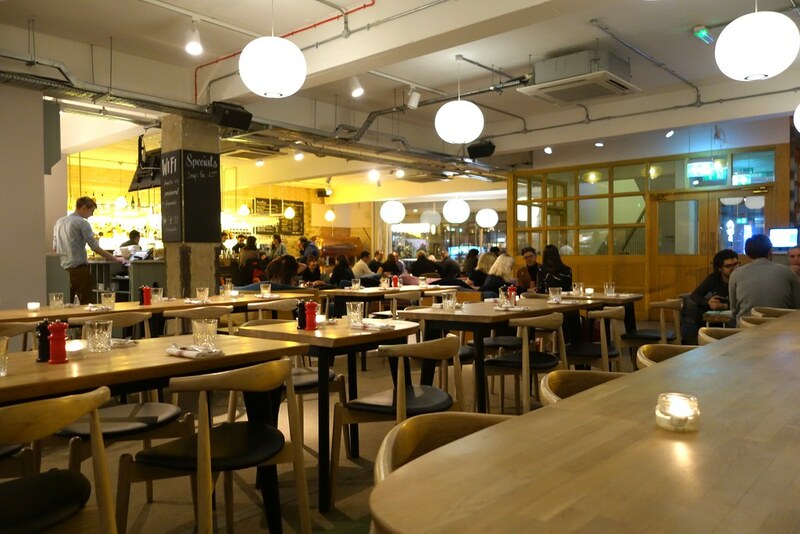 So I was more than a little sceptical when I was invited down to Forge & Co, a new restaurant on Shoreditch High Street that markets itself as ‘a unique social establishment in the heart of Shoreditch’, with a ‘canteen’ and a ‘lounge’ focusing on the ‘artisan’ and ‘urbane’. 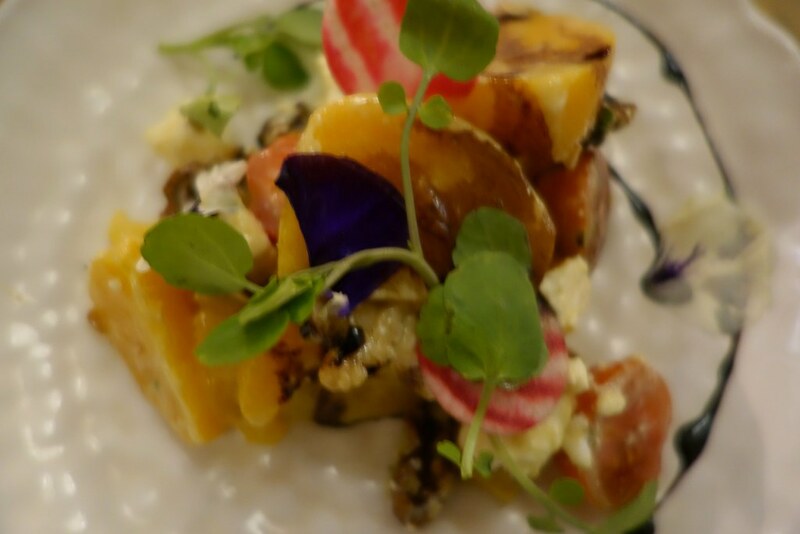 Never one to judge an establishment by it’s neighbourhood (or, in fact, its website – the best places should focus on what goes on the plate), we went down on a Tuesday evening to see what all the fuss was about. We were invited down, and had booked our table ahead of time. Forge & Co usually operates a membership policy that’s more than a little perplexing – it can be arranged on your first visit, and is free and available to all. Whether that’s just to create interest and buzz is unsure, but it’s worth popping down just in case the current policy changes to become more exclusive. We arrived for 7pm, and there were plenty of tables available in the canteen section, though the bar/lounge area was beginning to fill up considerably. The clientele was varied – the usual artsy media types you tend to find around Shoreditch were laughing and drinking away, while on the next table a rather grumpy looking student on her fourth latte seemed increasingly agitated by the growing noise around her. 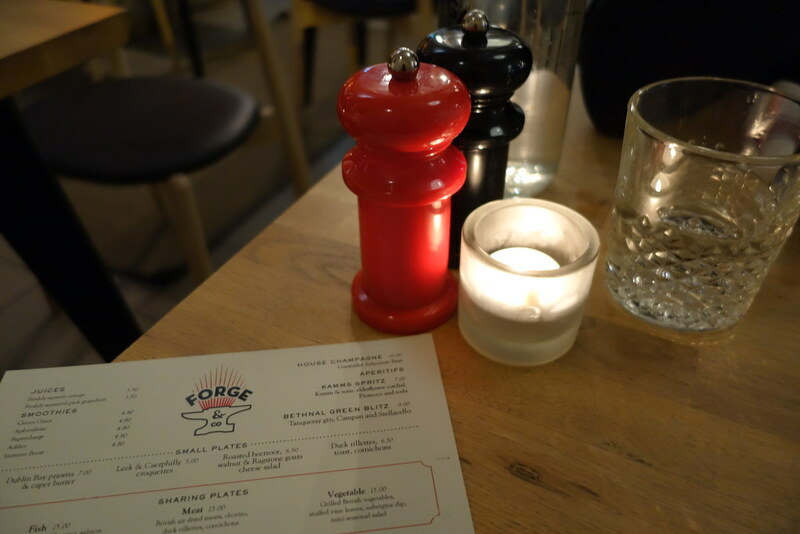 The atmosphere at Forge & Co is relaxed, and they seem to be getting it pretty spot on in terms of creating a social space for those to work, bring their laptops and plug in, while still being an open environment great for a light dinner or brunch. The canteen area reminded me of a trendy, modern ski lodge – the copper and clean lines combined with rustic accents like the log piles and exposed brick created an atmosphere conducive to relaxation, a great way to unwind after a long day at the office. I trusted our friendly and attentive waiter with the wine choice for the evening, and he chose well – I really enjoyed the Australian Malbec (The Listening Station, 2010). So far, so good – we enjoyed the wine as we turned our attentions to the most important part of the evening – the menu. 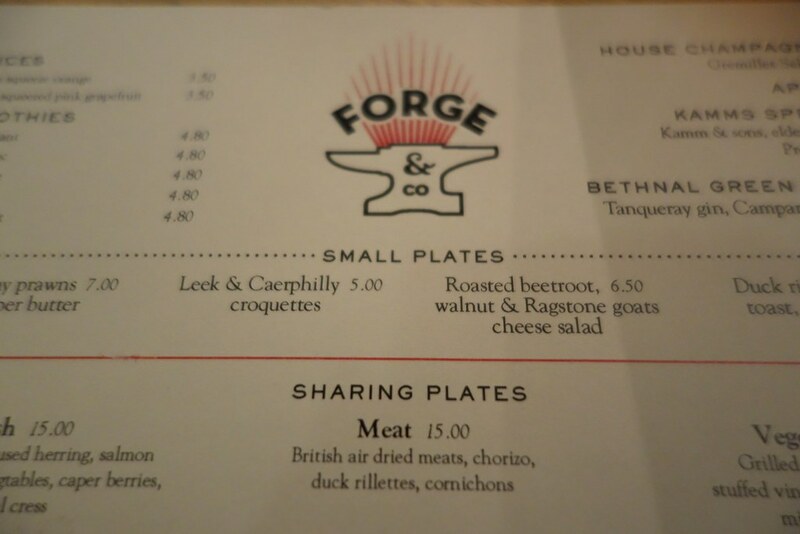 The All-Day Menu at Forge & Co is short, sweet and simple, serving locally-sourced produce where possible. It’s an eclectic mix of usual British fare – steaks, rump of lamb, chicken, as well as several dishes where they’ve taken a more exotic or unusual twist on the classics, like their signature ox heart burger, or tandoori tofu salad. 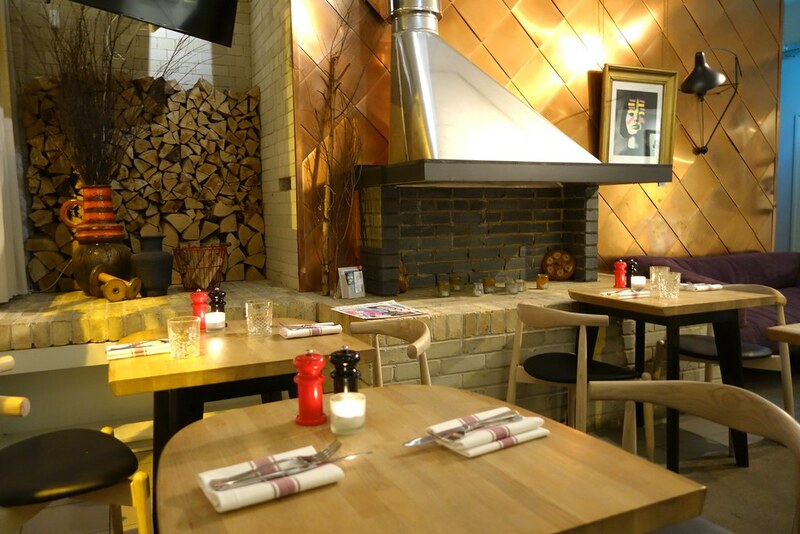 Forge & Co would be a great place to go with a mixed group, as there’s something to please almost everyone – the safe, staple choices for those who are particular about food, while some of the more eccentric dishes are sure to please adventurous foodies. For my starter, I went for the Dublin Bay prawns with caper butter. I absolutely adore capers, and I’ve never thought of having them with prawns – I usually throw them in with salads, or as part of a puttanesca sauce. 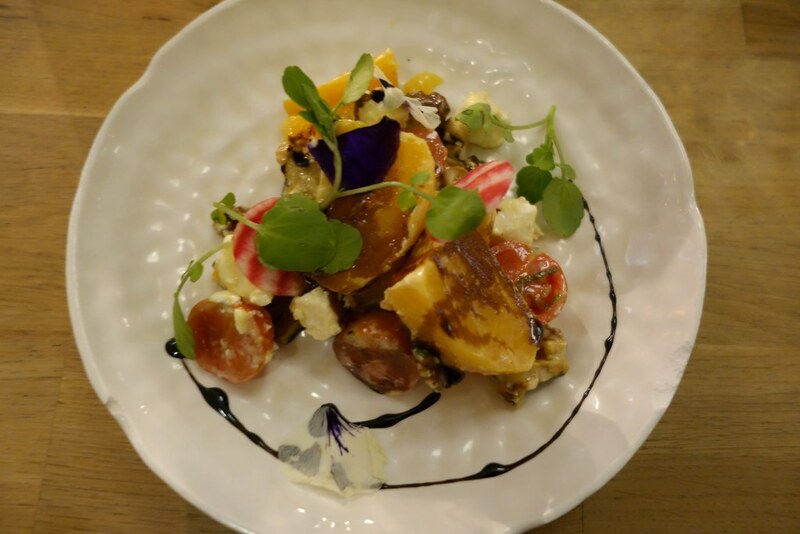 My boyfriend went for the roasted beetroot, walnut and Ragstone goats cheese salad. I thoroughly enjoyed my starter, although not for the reasons I’d originally expected. 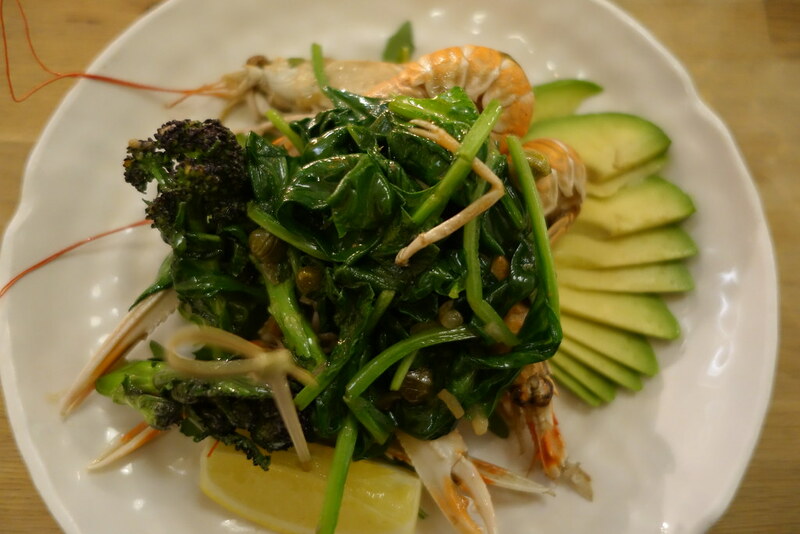 As informed by my waiter as I ordered, the Dubliners arrived with heads and shells intact, beautifully arranged on sea of sauteed spinach, purple sprouting broccoli and delicately placed avocado slivers which were carefully fanned out on my plate. Having been brought up by a Japanese mother, I’m most definitely not squeamish when it comes to my seafood, or any type of food for that matter – I’d happily look my food in the face before I eat it (which is probably something that would come up in a Psychopath Test). The Dublin Bay prawns were somewhat stringy, and not big enough to make it worth fiddling around with the crab cracker for the amount of flesh I was able to retrieve using the utensils I had. 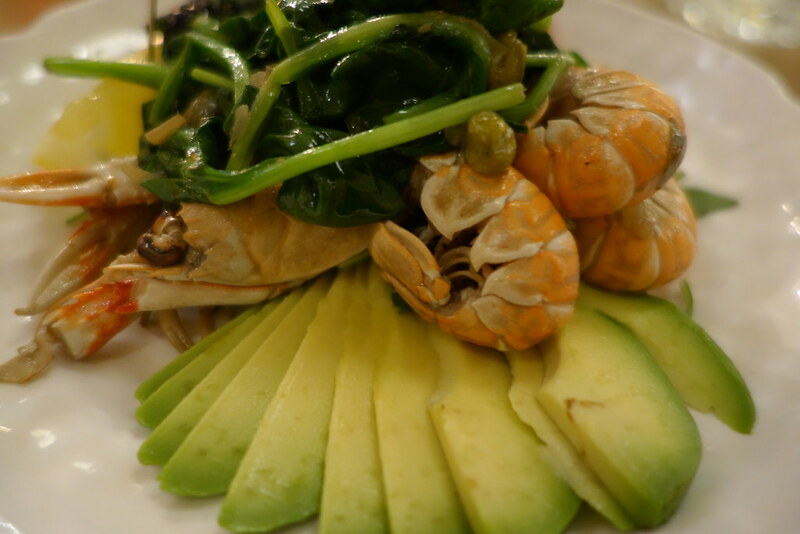 This might be because I’ve been completely spoiled from my recent trip to the crab markets in Kep, and I couldn’t help but wish that they’d substituted the prawns for a larger variety. The caper butter, however, was devastatingly good. The salty tartness of the caper butter, combined with the buttery texture of the avocado and the flavour of the garlic used to saute the greens completely saved the dish for me. 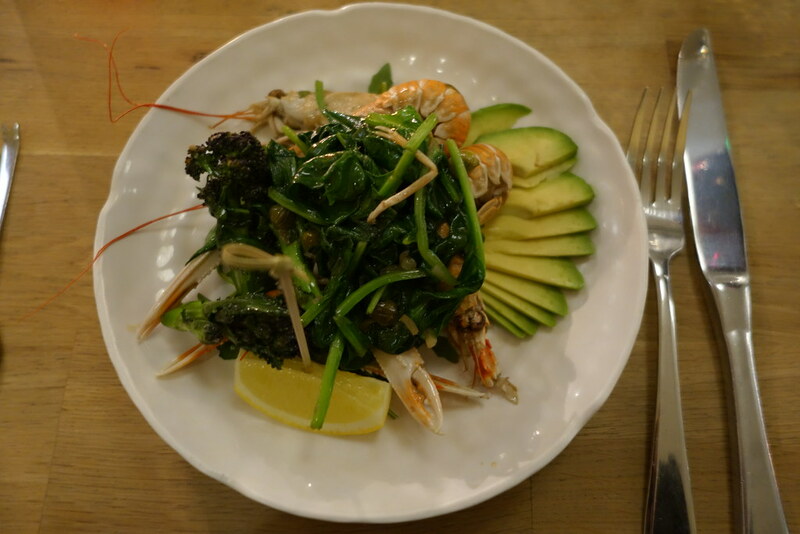 I would eat the greens with the caper butter as a starter alone, it was that good – and completely made up for any disappointment I’d felt after grappling with the prawns. 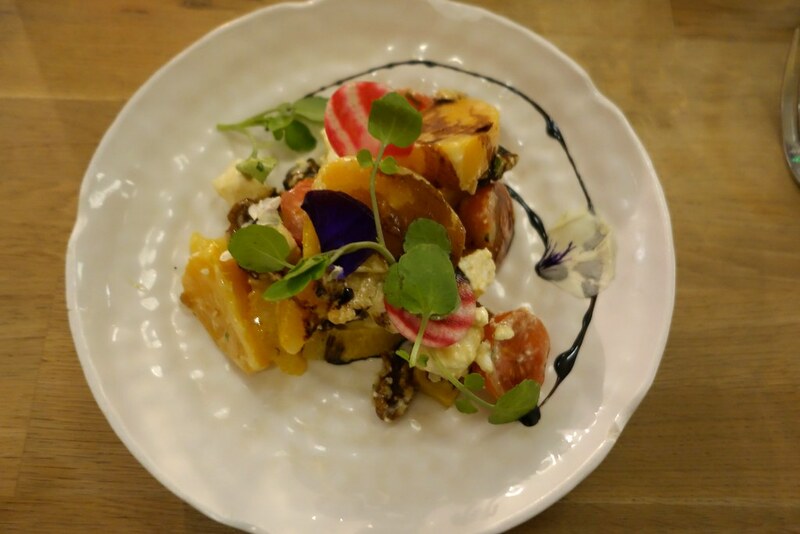 The roasted beetroot and goats cheese salad was visually stunning – the warm golden beetroot was served with toasted walnuts and drizzled with a balsamic reduction. The heat from the roasted beetroot warmed the goats cheese through, making this a perfect winter starter ideal for recreating at home. 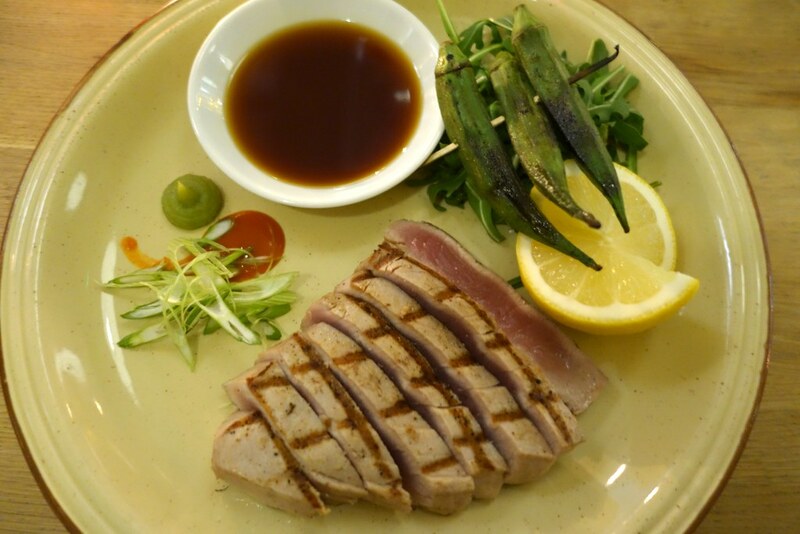 For my main course I opted for one of the more unusual dishes on the menu – the seared tuna with charred rocket and okra, served with a ponzu sauce. Ponzu is one of my favourite condiments – a Japanese combination of soy sauce and citrus juice, such as lemon or yuzu which is perfect with meat, fish and tofu. Still riding high on my New Years Resolution (to eat more vegetables), I ordered the main with a side of brussels sprouts with Camarthen lardons. The tuna was seared perfectly for my tastes – rare enough in the middle to remind me of aburi (broiled) sashimi, which is one of my favourite ways to eat tuna. This dish also rekindled my love of okra, the almost nutty and sticky texture was excellent charred, particularly with the lemony ponzu. The brussels sprouts were also delicious – I only wish these had been around during the dreaded Christmas dinners of my childhood. The combination of my main dish and side, however, was rather odd – although lovely on their own, I wouldn’t go for this bizarre combination again, and should’ve opted for the winter greens (or the chips, if I’m being honest). Andrew went for the Forge Ox heart burger – as Forge & Co’s signature dish, he didn’t really have a choice in the matter. 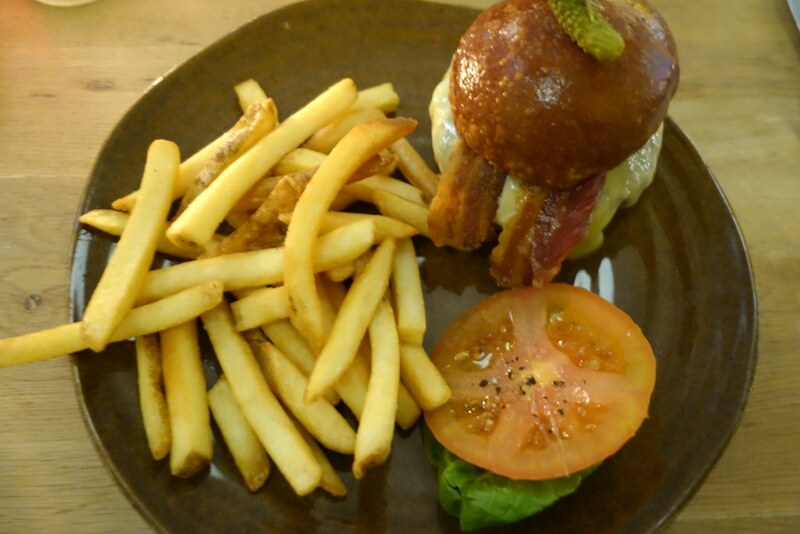 The Forge Ox heart burger patty consists of the spey side of beef and the ox heart, garnished with spinach, mature cheddar, streaky bacon aioli and chips. Optional extras included avocado, egg or bacon. 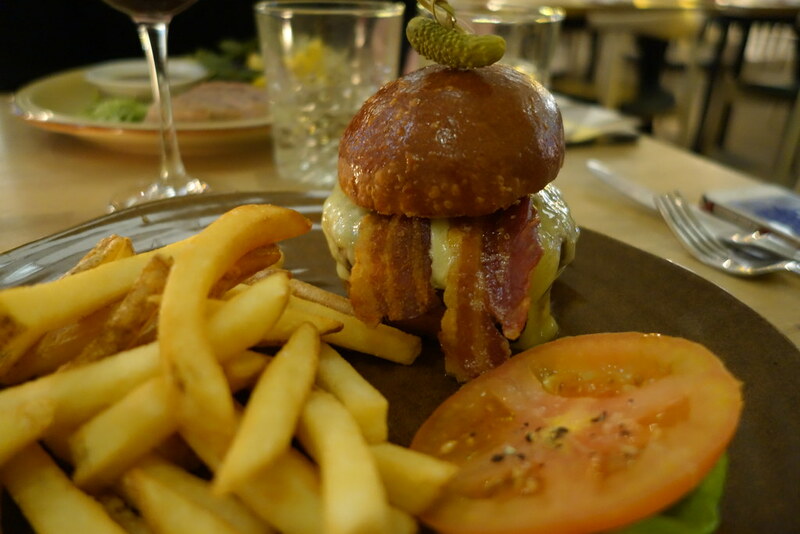 Andrew got his with extra bacon, and the Forge Ox burger was served on a brioche bun topped with a tiny gherkin. I sampled the patty, which was moist, and liberally seasoned – a little on the salty side, which I adore, but could divide opinion. 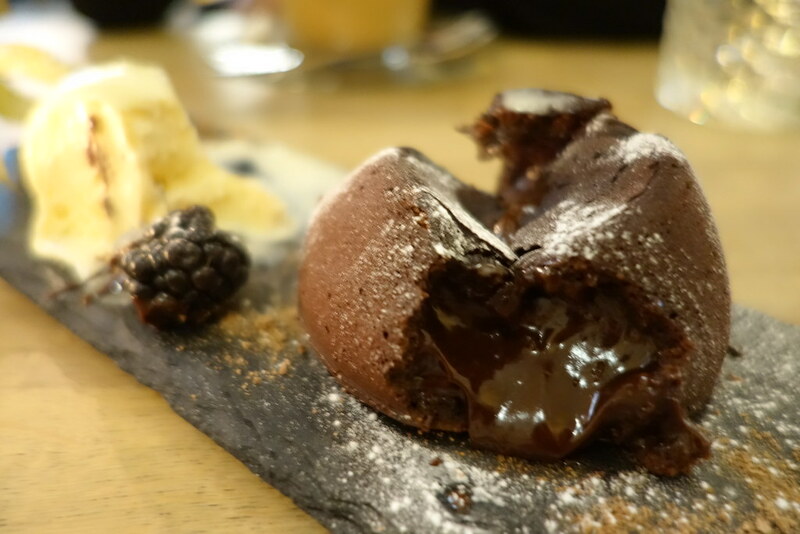 For pudding, we were brought an adorable looking chocolate fondant. It tried making eyes at me, but I managed to resist its charms. Due to its lack of platelets the fondant managed to make a mess of the table, which only served to revive Andrew’s one man crusade against food being served on slate slabs (which, to be fair, isn’t the wisest choice for a melty, runny, chocolatey dessert). 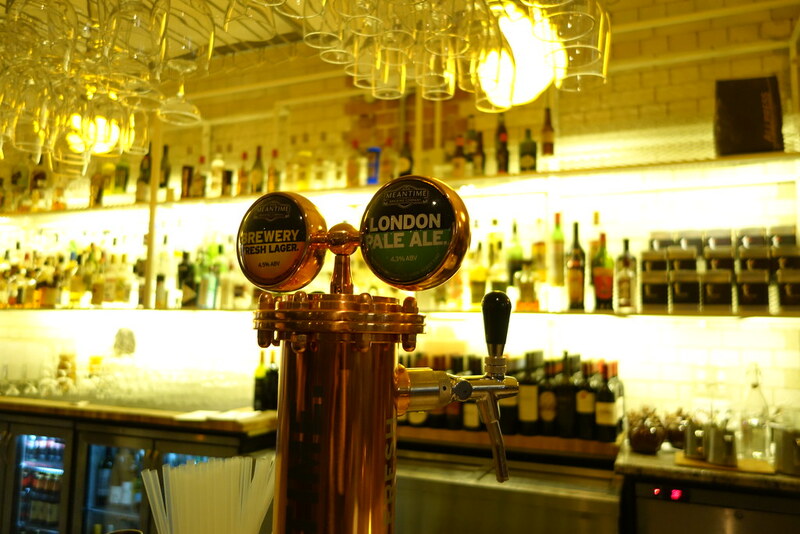 After our delicious meal we made a beeline for the bar – an aesthetically pleasing and gorgeously lit set with copper accents. 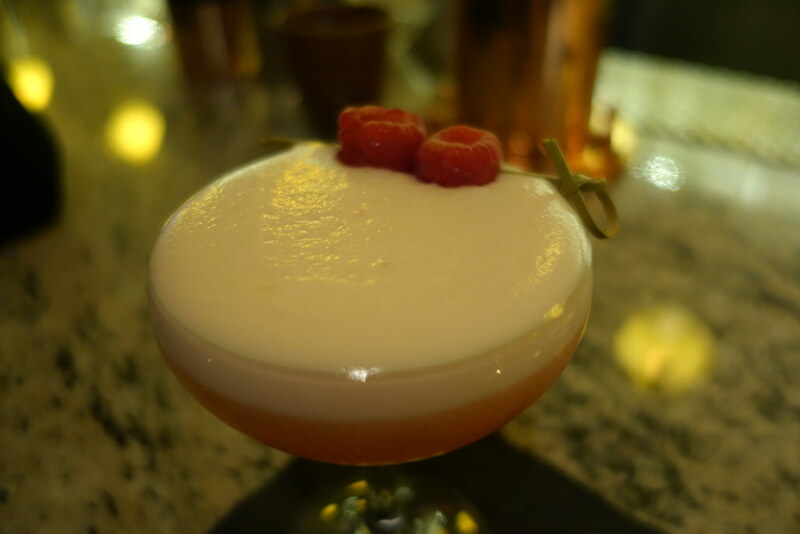 The Clover Club cocktail, a delicious blend of tart raspberry with Tanqueray, lemon and made foamy and almost creamy by the addition of egg white was the perfect ending to a pleasing sensory dining experience on so many levels – both visually and orally. 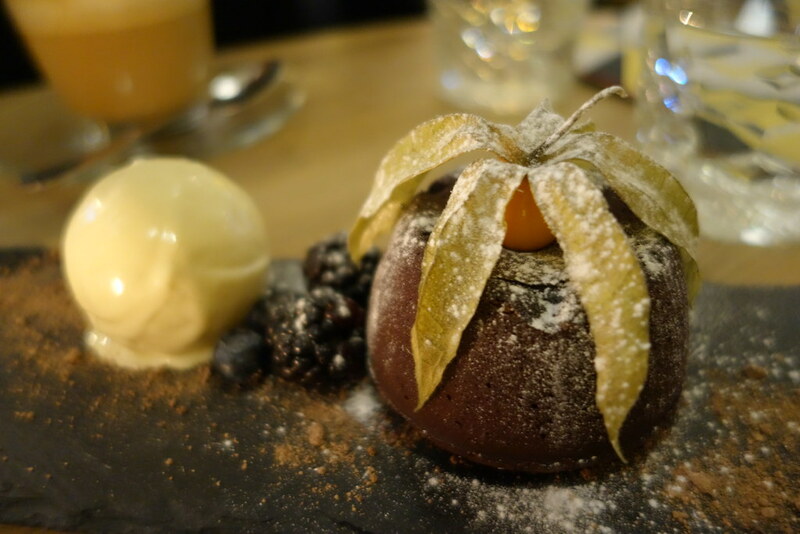 The Forge & Co exceeded all my expectations, and is a wonderful space for dining, working, socialising and relaxing in general. I thoroughly enjoyed my meal, and will definitely be popping down with my laptop in the future. 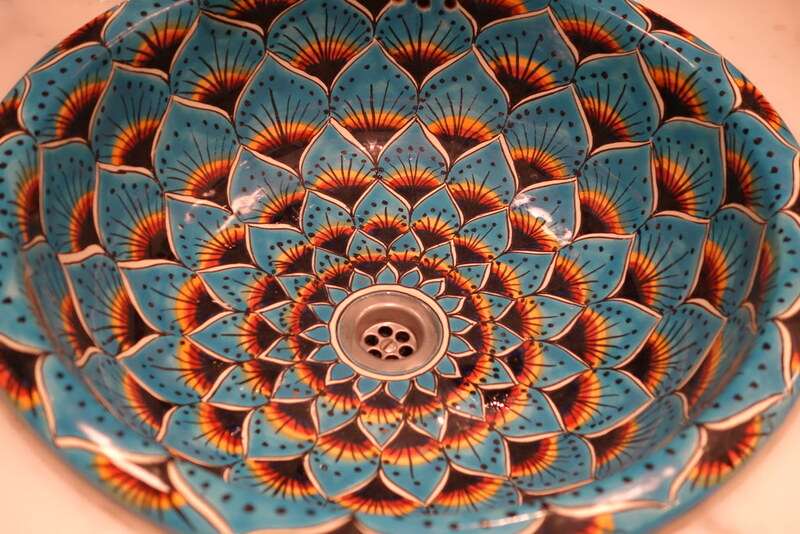 They also have the most beautiful bathroom sinks I’ve ever seen – not one for taking bathroom pictures, I had to make an exception in this case. 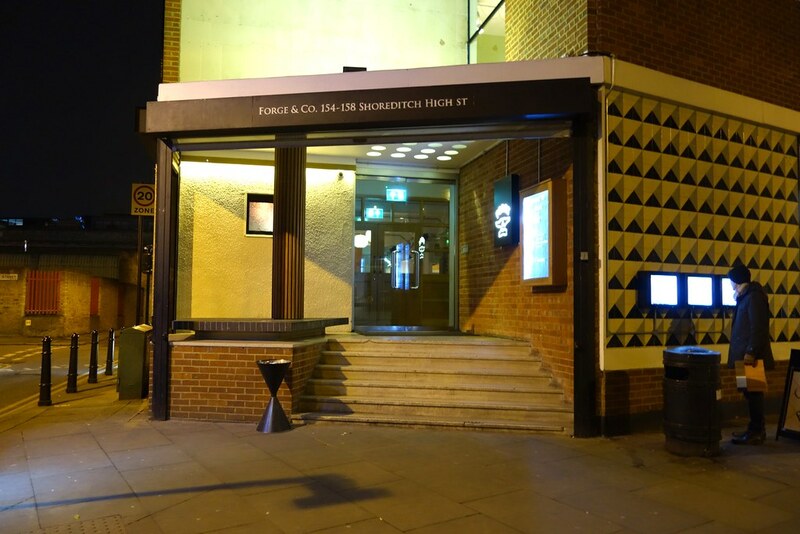 Forge&Co is located at 154-158 Shoreditch High Street, London, E1 6HU. Although I was invited to Forge & Co for a complimentary meal, all opinions are fully my own. Great review darling. I was eyeing the prawns with caper butter but was there during the day! I walk past here daily but was not sure what to expect, now I am definitely going to pop and and give it a go the food looks incredible. You should Emma! It was great – the coffees good too! 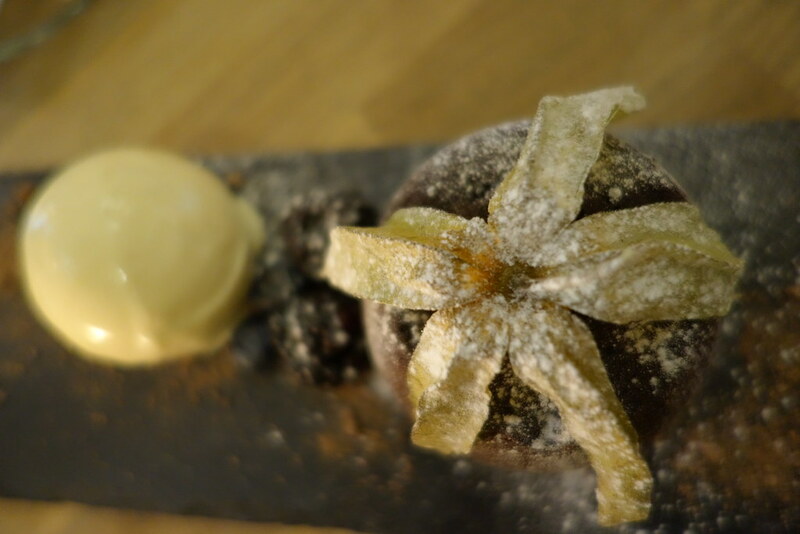 This all looks lovely and delicious, but I’m totally with Andrew regarding the slate slabs! They’re not just messy they’re difficult for wait staff to pick up after you’ve finished and it seems like everyone has jumped on that bandwagon! It is a bizarre trend – I don’t think they look particularly nice either!